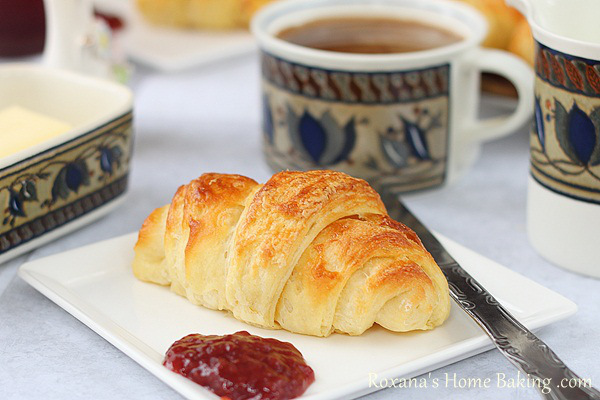 These croissants are easy to make, however, they take lots of time - about 4 hours of rising time. If you like to bake - you will enjoy the wonderful finished product you get. In a large mixing bowl sift the flour and salt. Make a well in the middle. Mix the yeast with the 3/4 cup milk, stir until dissolved and pour it into the flour. Mix a little bit (the mixture is going to be dry) and add the sugar and egg. With a dough whisk or a wooden spoon try and bring the dough together slowly adding the remaining 1/2 cup milk. When all the milk is added the dough is going to be quite sticky. Don't panic and definitely don't add more flour. Place the dough on your working area and knead by hand until doesn't stick anymore. it's going to be around 7-10 minutes. Place the dough into a clean oiled bowl, cover with plastic foil and let it rise until double in volume. Meanwhile work the butter. Remove the butter from the wrapping paper and place both sticks on a plastic foil. Cover with plastic foil and with the rolling pin, flatten the butter until it forms a block about 3/4 inch thick. Put the butter back in the fridge. When the dough has doubled in volume, punch it down, cover again and place it in the fridge until double in volume again. When the dough has risen for the second time, place it on a floured surface, roll it our into a 12 inch square. Place the block of butter in the middle and fold the corners of the dough over the butter like an envelope, tucking the edges to completely hide the butter. Roll the dough into a rectangle, about 3/4 inch thick, twice as long as it is wide. Roll the upper third down and the bottom third up. Wrap in plastic foil and chill for 20 minutes. Take the dough out of the fridge, turn to 90 degrees, roll out into a rectangle and fold again. Chill for 20 more minutes, wrapped in foil. Roll if out again, turning the dough, and fold one more. Chill for 20 more minutes, wrapped in plastic foil. Divide the dough in half and with a pizza cutter cut triangles. Roll the croissants starting from the wide side toward the sharp point. Place the croissants on a baking sheet, spaced well apart. Leave to rise one last time until double in size. Meanwhile heat the oven to 425F. Brush the croissants with egg wash and bake until puffed and golden, for 13-17 minutes depending on their size.